IMG_1750, originally uploaded by bieloh1. The other day this pretty dog wandered up to our house. He was starving. He saw me put some food down and he ran as fast as he could toward me to the food. He was so hungry. He is a beautiful hunting dog. We learned later that he is a “trigg walker”. 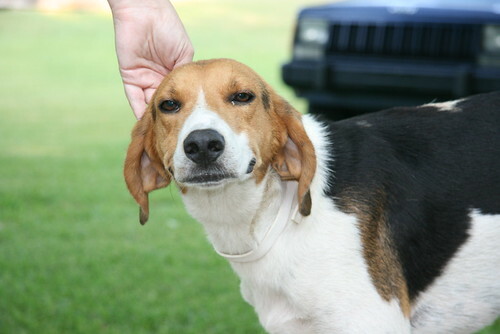 He is a coonhound – related to the American Foxhound. He just had a flea collar on, but we thought he might have gotten separated from his family when he was hunting or something. We asked around at church and in town, and we were directed to some people not far from us. (Turns out they are distant relations to David.) They didn’t own the dog, but they knew who did. So David took him back. I miss him. He liked to lay on our back deck and at the corner of the house. He is one of the calmest sweetest dogs that I have ever met. I am glad he is back in his home though. He was probably ready to go. All we had was our lowfat geriatric dog food. He probably wasn’t thrilled with it, although he was so hungry that I guess he didn’t mind too much. I was planning to get him some better food, but then we found his home. We didn’t name him officially, but we liked calling him “Walker Texas Ranger” since he is a Treeing Walker Coonhound. I thought he looked like a Charlie, and David liked Carlisle. As in Charlie the Coonhound, or Carlisle the Coonhound. Such a nice dog.